I have been meaning to review Rain for some time, but I had heard that it had really went downhill from several friends so I figured I would give it one more shot before I put my “pen to paper” as it were. I am extremely glad I waited, because this past visit to Rain really matched all I had been hearing. I do not like doing negative reviews, but I assure you that this is a (summarized) factual account of my recent visit. Kevin and I showed up on a Friday night and the place was a ghost town. There were maybe four tables in the entire restaurant. This is a big red flag, but we were able to get one of the tables with the cushy chairs so I figured hey lets just go with this. First, the service was poor. I think our server was doing his best, but the entire experience was a comedy of errors. First, our drink order came out wrong. Second, he put our sushi in as one seat, so it came out on one big plate. This is unacceptable, because Kevin hates spicy food. So, it was a big deal (and took over ten minutes) to get our food separated out. I could hear the argument behind the sushi bar about “well you have to put it in separately if you want it to come out separately”. Once we received our food, I was missing some of the food I had ordered. Turns out, one of the sushi rolls I ordered was never put into the computer. Once it did come out, and we began to eat, we discovered that the sushi was bland and tasteless. All in all, a thoroughly disappointing experience. Another one onto the ban list, and its sad because Rain used to be overpriced but delicious. Now it’s just overpriced. Service: 1/5 – Horrible. Just absolutely horrible. I did still tip well of course! No excuse for not tipping. Decor: 3/5 – The Decor in rain is cool, I liked looking at the fish. One of them glowed in the black light. The shining star in the bleak experience, as it were. Overall: 1/5 – If you want Sushi, allow me to point you to Sakura in Germantown. That place is the bomb. Sekisui is also a fine choice, and many people love Osaka. I recently went on vacation to Asheville/ Lake Lure, NC with Kevin and his parents. While there, we took in a few restaurants. The inaugural review on the Stephen O Show is of one of these restaurants. We took a walking eating tour of downtown Asheville called “Eating Asheville”. It was awesome. One of the places mentioned (but not visited) was “Chorizo”. Later on that evening, we decided to try it out. A Latin restaurant, it was cozy inside with really good service. I would like to tell you what I had, but I honestly cannot remember what it was called. It was this huge bowl of salmon, mussels, pineapple, and this unbelievably tasty broth. It came with some accouterments such as tortillas, etc, but I had no idea how to eat it. In the end I just about drank the broth, but was unable to finish this delicious behemoth of a meal. I can also mention that my friend had the Paella and he said it was amazing. For dessert I had this powerful coffee concoction and a dense chocolate mousse pie. Let me just say this: the service was legit and the food was great. Deliciousness: 4/5 – This was not mexican food (which is delicious, mind you), it was Latin food! It was new and exciting and not the kind of thing I get to eat very often. Service: 4/5 – I really don’t have anything bad to say about the service, it was quality. Decor: 3/5 – Honestly I don’t remember it, except that it was decent. I was too focused on the food! Wow-factor: 4/5 – This place had that special something. i recommend it without reservation. Overall: 4/5 – If you are in downtown Asheville, you really should check out Chorizo! Friends, I am here to review something unusual: a service. I mean, I do say that I review everything, so I guess this falls under my expansive umbrella. I want to talk to you about MoviePass , which is a new (beta) service that promises “Unlimited” movies in theaters for a flat fee every month. Let me tell you that I have waited since I was a teenager for such a thing, and have often lamented that it did not exist. I would love to see more movies than just those I am 90% sure that I will like. I would like to do that if for no other reason than to be able to review more movies. To take “risks” without spending a boatload of cash. When I joined the waiting list for this Beta service (that started in San Francisco in 2011 I believe), I had no confidence that it would ever be successful or (even if it did) make its way to Memphis. I then heard that it had lost a court case, and that it was no more. However, this information was incomplete and partially incorrect! I got an email in my inbox today announcing that MoviePass was in Memphis, and I was exclusively invited to join. Imagine my excitement! However, I am an adult now and I have learned that when something seems too good to be true, then it probably is too good to be true. So, I did some research. The way MoviePass works is: 1) they send you a debit card (its technically a Discover card, and yes it is accepted at Malco), 2) you go to theater (you cannot buy tickets in advance), 3) you check in on iOS or Android app to the theater AND movie/showtime you want to see, 4) you use the MoviePass card at the kiosk OR theater counter. This is the compromise that they worked out with the theater chains for this, the third iteration of their service. This in itself was not a deal-breaker for me, so I checked for further conditions. I then learned that “Unlimited” is kind of a misnomer. You can buy one (1) ticket per day. Ok, that’s not too bad. I can count on one hand the amount of times in my life I have seen two movies or more in a single day. So, I was ready to buy! The cost varies per market, from $29.99 per month to $39.00 per month. That is basically four movies, and the commitment (just for the first year) is annual (though you pay monthly). I would be willing to try it for a year, just to see how it is. That being said, I had one more question. I contacted chat support, and asked the key question: Can you go see a movie more than once? Their answer? NO. This is ridiculous. Case closed. So you can see one movie a day, but each movie ONLY once? First, not only are there not that many quality movies released per month, there are rarely that many movies released in a month PERIOD. This “Unlimited” moniker goes from being a “sort of” truth to being a patent falsehood. Further Thoughts: This is stupid. I can take all the other limitations and rules, but the inability to see a movie more than once makes this service not worth it for me. Maybe if Hollywood was cranking out multiple quality movies a week, but that just isn’t often the case. I probably see about 2 movies a month on average (when you factor in summer, when I see much more than any other time of year), and with this stupid rule it would just not be a good investment. It is the first movie review on the Stephen O Show! I have not “firmed up” how exactly I am going to do this, so bear with me. I saw this movie with a ton of friends, which is my preferred way to “take in” a film. Whenever I do this, i will endeavor to also include their thoughts on the movie (although the ratings and conclusion will be my own). As usual, I will try to keep spoilers out of my reviews. Let’s get right into it. Taken 2 is, as my friend Jon has said, the consummate sequel. It was made to make more money out of the success of the first movie. Now, of course, that is partly why ALL sequels are made, but in some cases (like this) it seems to be the only reason. It is basically the same concept with less plot, worse acting, etc. That being said, I am not saying that this movie was (total) crap. Taken 2 has a lot more build-up and lead-in than the original. It actually feels slow in the beginning. The main problem I have with this movie (well, one of two) is that there is a ton of build up and then once the action revs up everything is over too quickly. I was really looking forward to the entire point of this movie, which is that Liam Neeson kills bad guys. It is why all of us are there to see the film, if you think about it. However, when Liam does start killing bad guys, the next thing you know the credits are rolling. As I said, the beginning is pretty bunk. The entire setup and plot feels weak (why would you take your family to Istanbul after what happened to you overseas last time?! ), but we know it is a necessary evil so that Liam can once again play the avenging angel. I was expecting a weak plot, but what I was not expecting was the terrible dialog. There is a car chase scene where the same 3-4 lines are repeated over and over and over again. At first I was like, hmmm, but as the scene drags on you realize that it sounds like they just replayed them for the entire scene. Also, not to spoil anything but you will see some driving that is absolutely ludicrous for someone “just learning to drive”. Wow. Completely unbelievable. That entire scene is the worst part of the movie, even though I enjoyed it anyway (due to the fact I am a sucker for car chases). When Liam gets to killing these terrible people, it’s awesome. Unfortunately, it’s just too short. To put it bluntly, not enough killing. I can put up with the bad dialog and the slow start, but you have to give a payoff. There was one, but I do not think it was sufficient. This wasn’t a bad movie, I wasn’t disappointed with it perse, but it wasn’t a great movie either. Decent. It was decent. Liam Neeson kills some bad guys, although in this reviewers opinion far too few of them. I think we like movies like this because the people getting killed are the worst sort. The slave trade? No one is shedding any tears over these monsters’ deaths, and in fact you have that feeling that for every one of these people Liam Neeson kills, everyone’s children just got a little safer, and the world gets a little bit better. I like that. Rip-off Factor: (you want a low score here) 3/5 – I really feel like we didnt get enough deaths for all the bad dialog and sludgy plot we endured. I would say unless you really love watching Liam Neeson do his thing (which I do), see a Matinee or better yet just wait for Redbox. I really don’t want a “Taken 3: The Takening” in a few years. Glutton for Punishment: (you want a high score) 1.5/5 – The ONLY way I would see this again is if it was with a close friend who begged me to see it with them. Plot: 1/5 – Plot was super weak. Four points for Liam. Acting: 1/5 – Bad. Very bad. Even Liam was phoning in the non-action scenes. Man Score: 4.5/5 – Ignoring the boring bits, this was a great man movie! Car chase, violence, only thing lacking was explosions. Overall: 2.5/5 – I like Liam Neeson doing his thing, so it gets a 2.5 out of 5. That being said, it wasnt amazing. Redbox or Vudu it. I talked to some friends from church who had tried this beast of a beverage, so I just had to give it a try myself. The bottle is pretty neat looking, and quite frankly intimidating. It sets the bar high for the energy that you expect to get out of it. Getting the lid off will require the services of a bottle opener, and I still had to work at it from two sides. This thing is serious about staying sealed. Leaning in for the aroma, I have to say that it smells a little funky. It has that energy drink smell that I am not crazy about. First sip impression is good! It’s tasty. I am actually a big fan of how this drink tastes. It reminds me of a standard energy drink, but lacks the harsh acidic bite that a lot of them have. It is more smooth and mellow, and very sweet. Rolling it around on the palate I have to say this is one of the tastiest energy drinks I have ever had. It just keeps getting better. That is very good news, because this thing was $5. I am not kidding. The things I do for my fans. Ubermonster is no joke. It easily has twice the energy of other energy drinks I have consumed. I still have about 1/4 of it left about 2.5 hours later. So basically it tastes great, it’s smooth without an acidic bite, and I am feeling tons of energy. The price is horrible but that’s really the only negative I can give you. Lets talk ingredients. This is a standard energy drink but it only has 200 calories for the whole 16.9 ounce glass bottle. That is a lot less than I have seen before. It’s still high, but if you are taking the plunge and doing a full power energy drink it is not bad. There are vitamins and an energy blend to consider as well. For those interested in such information, there are 50g of sugar in the entire bottle and 320 mg of sodium. Vitamins: 100% of Vitamin B2, B3, B6, and B12. This thing is delicious, and really delivered on the energy promise. I had very low twitch on it, and it kept me at 100%+ for hours. If you really feel like spending $5 on a rock-solid energy drink, this is definitely the way to go. Energy Level: 5/5 I haven’t ever had an energy drink amp me up more. Twitch Factor: 2/5 This is a score you WANT to be low. I had a little nervous energy, but most of it was “clean”. Flavor: 4/5 This thing was absolutely delicious. Value: 3/5 Very expensive. I mean, it’s not a huge drink and you are probably going to drink the whole thing in one sitting. Five dollars is a lot to spend on a tasty beverage, but its such a good energy drink that it’s just about worth it. Overall: 4.5/5 I am giving it 4.5 because I just can’t imagine a better energy drink. I sure haven’t had one. If you like energy drinks, and you want to do a full power one, and you have extra money, give it a shot. Leave comments if you have tried this thing, let me know what you thought. I saw a friend posting about this stuff on instagram, so I had to give it a shot. First impressions, it looks like milky water. The aroma is faintly citrus-ey. It smells like citrus zest. After a few minutes of contemplation, I have come to the conclusion that it smells like grapefruit zest. As for taste, it pretty much tastes like grapefruit zest as well. It doesn’t have the “bite” of grapefruit juice, or the sweetness of pink grapefruit. It just tastes like grapefruit zest smells. Is this a good thing? Not really so much for me. I don’t hate the taste, let me be clear, but I won’t be lining up to pay $3 for another bottle of this any time soon. I will be reviewing the other “Neuro” flavors, though, and if you like grapefruit you may absolutely love this stuff. Since this is a “Purposeful Brew”, lets take a look at the ingredients. This stuff is sweetened with “crystalline fructose”, so it doesn’t have the chemical artificial sweetener taste that I associate with many low-calorie drinks. That is a plus. As for its “Active ingredients”, you do have some vitamin content and some “proprietary blend” content. We will address these separately. Vitamins: Vitamin D 50%, Thiamin 30%, Niacin 25%, Vitamin B6 200%, Vitamin B12 100%. That is actually pretty good. The more I drink this thing the more I like it. I mean, still I don’t intend to buy it again but if someone offered me one I would drink it with no hesitation. Proprietary Blend: 335mg of L-theanine (boosts immune system, improves mood, stress relief), Phosphatidylserine (mood enhance, de-stress, improve cognitive function), Choline Alphoscerate (another cognitive improvement supplement), and Chamomile (anti-anxiety). After looking all of this stuff up (some I already knew, but I like to be thorough), I am not displeased with the “blend”. Sometimes these drinks throw together some really sketchy stuff but this is pretty legit. I haven’t noticed much of an effect from the drink, but I wasn’t particularly stressed when I drank it. 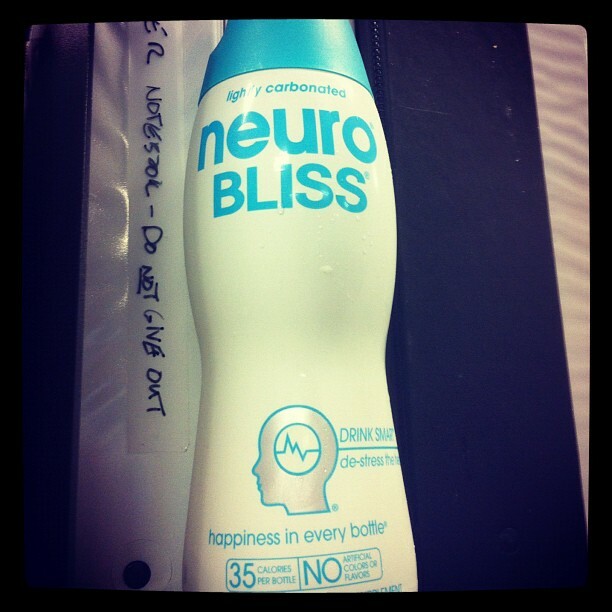 If you like grapefruit, and you want a “de stress” drink, give Neuro Bliss a try. If you don’t like grapefruit, give it a pass. Effect: ?/5 I don’t know whether its working. I don’t feel anything. Flavor: 2/5 I don’t like grapefruit, but it is crisp and sort of refreshing. Value: 2/5 It was $3, which seems a bit high for that size bottle. Overall: 2/5 I wouldn’t buy it again, but I would drink it for free if it was around. I have a feeling this “chocolate bar review extravaganza” is going to be the “first post” that takes six weeks to do, so I am going to do a “soft open” as it were. Wow, too many quotation marks. Anyway, I figured I would take this first post to let you know how the various and sundry reviews are going to work, and how the scoring method is going to function for each. I want this to be interesting, although if complexity bogs me down I reserve the right to revert to a simple “out of five stars” or “out of ten” ranking. All of this is subject to change at any time. We are just getting started here. These reviews are not changing. Where appropriate, however, I will make additional notes for my friends. This category encompasses everything from sodas to energy drinks, coffee to tea. The review elements will change based on the type of drink, as detailed below. I will also detail any ingredients that are odd or appropriate based on the type of drink. Some minor notes. Twitch factor is how twitchy the drink makes you. The best energy drinks will give high energy for low twitch. Replay is how good is the tea when you re-steep it two or more times. A Purposeful Brew is a beverage that claims to have some value other than “energy” or refreshment. Ah, movie reviews. Some of you who know me are out there going “Well, everyone knows Stephen loves everything!” This is patently untrue. With movie prices out of the frame, I usually only go see movies I am reasonably certain I will enjoy. Therefore, I have a higher than average rating on the movies I review. Once you understand that, I think you will understand why I skew higher than most other people. Movies will receive the following ratings: ROF (rip-off factor), Glutton for Punishment, Plot, Special Effects, Man Score, and Overall. ROF is how ripped off I feel at paying $10 for the movie, Glutton for Punishment is a score representing the chance that I would pay to see it again at the theater, Man Score is how manly the movie was. It is possible to get a negative in this category. Reviewing books is something I have never attempted before. Due to the nature of the beast, and how tastes change over time, I will be doing Ancient and Current reviews. Ancient reviews will be of what I remember, Current reviews will be of books I have read or completed reading in the past 12 months. I would like to post an Ancient review of a book, re-read it, and then post a Current review. Categories are: Addictive, Boredom, Care factor, Replay, and Overall. For non-fiction books, there is also the category of Absorption (did I learn anything?). Care factor means that I actually care about what is happening in the book. The best books draw you in and cause you to care. It is possible to have a good book with no care factor, i suppose, but it is one of the things I value most highly. Addictive books are page turners, and boredom just measures how boring the book can be. Even really good books have boring bits in them sometimes. I have never done this one before either, but here are our categories: Must See TV, Entertainment, DVR. Must See TV represents how badly you absolutely have to watch every episode every week. DVR means that you consistently give up a coveted DVR time slot to record the show. Another new one for me. I haven’t even decided on the categories yet. On my first music review post, we will knock that one out. When reviewing food, I will use whatever categories are specific to the type of item (e.g., Chocolate) I am reviewing. I know I am biting off a lot with this blog, but I am always getting requests from people to review more stuff, so here it is. Also, and most importantly, I enjoy it. Thanks for reading, hopefully post my first review tonight/tomorrow morning.